Consumers trust pharmaceutical manufacturers to uphold the highest standards of safety when packaging medications. As any manufacturer knows, there are countless variables that must be controlled and monitored in order to ensure the highest levels of safety. Does your company have the machinery needed to achieve total consumer safety? Everything from how pharmaceuticals are filled and packaged to the methods used for storage and transportation can impact the integrity of the products. Though you can’t control every step of the supply chain, you can take a close look at your own pharmaceutical filling machines and make all necessary changes to make sure your pharmaceutical filler is operating efficiently at all times. Just like you would with a car, it’s vital to perform regular preventative maintenance on all of your liquid pharmaceutical filling machines. Even the very best liquid fillers wear down eventually, and catching the need for parts replacement for a problem actually arises will save you immeasurable time and money. Completing regular checkups on your machines will also guarantee that parts are kept in top shape and shown a bit of TLC when needed. Nothing can happen without knowledgeable, motivated, and skilled employees. This is why a well-trained employee is such an asset. Remember that staff members need to be retrained whenever machinery is replaced, reprogrammed, or even repaired significantly. Strategic and attentive training will ensure that operators know how to handle new equipment and use it with maximum efficiency. This minimizes errors and recalls while enhancing customer satisfaction. In a business, nothing gets better without specific thought and consideration. This is why the creation and implementation of a performance improvement plan will help you measure your facility’s output and brainstorm how to improve upon your numbers even more. A performance improvement plan is valuable because it can help you specify each exact area of inefficiency and determine the best solution. Perhaps you need better training, or maybe one of your liquid filling machines is outdated and needs to be replaced. Safety and efficiency only become complicated when you neglect the proactive measures that support ongoing success. 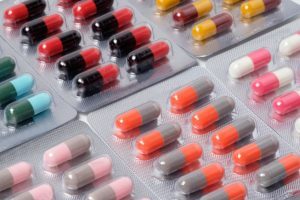 You can also improve your company’s pharmaceutical packaging process by calling (781) 986-7500 to speak to an expert at Econocorp Inc. As a recognized worldwide leader in cartoning, tray forming, and casepacking for moderate and lower production volumes, Econocorp can help you uncover the packaging solutions that streamline your success.